This page has great free preschool lesson plans focusing on the topic of Colors and Shapes. 1. The classroom as a teacher - These activities can be done by making simple changes in the classroom. 1. What colors do you see around you? 2. What shapes do you recognize around you? Sorting Game: Sort various items by their color and than by their shapes. 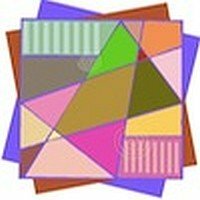 I have a page dedicated to teaching preschoolers about math shapes. Word wall colors: Red, blue, yellow, green, orange, purple, brown, black, white. Write each word with the corresponding color it represent for an easy recollection. Word wall shapes: triangle, rectangle, square, circle. Draw each shape and write it's name inside the drawing. Cut out your drawings and place them at an eye level with the children. In your newsletter, explain the theme and inform the parents that everyday in class you will focus on a specific color. Ask the parents to send the children wearing the color of the day. Based on the color of the day, sort the toys and only take out toys in that color. Do the same in the art center, painting, creative center and even choose your snack based on the color of the day. The children love that each color has a special day and you can feel the celebration in the air. Add these colorful scarves to allow the children ways of playing with colors through music and movement. Using the droppers have the children place water drops on the coffee filter paper. Beading: Can you make a bracelet using only one color of beads? Pom Pom Sorting: Sort pom pom balls by color using tweezers and thongs to pick them up. 5. Play dough corresponding to the color of the day.